During the 30th Shark Week, go to Discovery.com/ SwedishFishCHOMPED and enter Discovery Channel Shark Week Swedish Fish Chomped Sweepstakes for a chance to win a family trip to Oahu, Hawaii to have a real shark encounter. Who Can Enter? 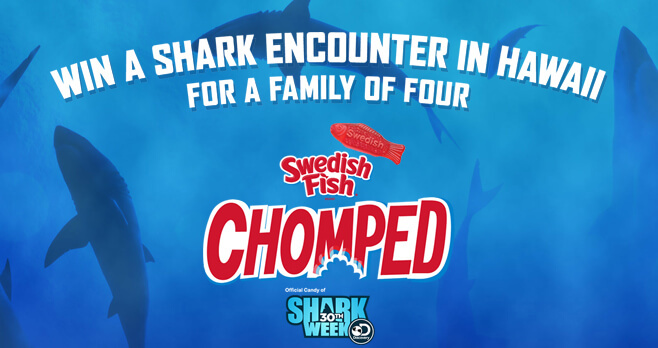 The Discovery Channel Shark Week Swedish Fish Chomped Sweepstakes is open only to legal residents of the 50 United States and the District of Columbia and who have reached the age of majority in their state of residence at time of entry. When To Enter? Sweepstakes begins on Monday April 23, 2018 at 6:00 p.m. ET and ends on Sunday September 30, 2018 at 11:59 p.m. ET. What Is The Sweepstakes Prize? The Grand Prize consists of a trip for the winner and 3 guests to Oahu, Hawaii. Who Are The Sweepstakes Winners? To receive a list of winners, mail a self-addressed, stamped envelope to be received by November 15, 2018, to Shark Week Chomped Sweepstakes Winner List, One Discovery Place, Silver Spring, MD 20910. I,am a older lady. but I love shark week. and the other interesting movies you all show. thanks for the great work you all do to please every one. every one I know loves the shows.